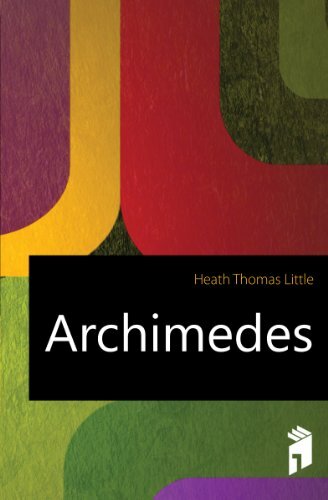 History and tradition know Archimedes almost exclusively as the inventor of a number of ingenious mechanical appliances, things which naturally appeal more to the popular imagination than the subtleties of pure mathematics.And it is to be feared that few who are not experts in the history of mathematics have any acquaintance with the details of the original discoveries in mathematics of the greatest mathematician of antiquity, perhaps the greatest mathematical genius that the world has ever seen. Exploring the concepts, ideas, and results of mathematics is a fascinating topic. In this course you will see firsthand many of the results that have made what mathematics is today and meet the mathematicians that created them. In 100 years the American mathematical community has grown to an influential group that sets the standard for the rest of the world. This book in three volumes depicts the political and mathematical forces that have shaped the AMS in the past century. Ten British mathematicians: George Peacock, Augustus De Morgan, Sir William Rowan Hamilton, George Boole, Arthur Cayley, William Kingdon Clifford, Henry John Stephen Smith, James Joseph Sylvester, Thomas Penyngton Kirkman, Isaac Todhunter.